I recently purchased a 3rd Generation 64 Gigabyte Apple iPod Touch. The original intent was to use it to listen to Music (MP3s), watch movies, and access the internet on the go. Basically, an iPod Touch and most of the other “Smart Phones” are miniature computers. Most use a Flash Hard Drive for storage and have rechargeable lithium batteries. Smart Phones, such as the Apple iPhone or the Motorola Droid can access the Internet via a 3G network, which works the same way as making a Cell Phone call, i.e., the internet data is sent and received via a cell phone signal to the nearest cell tower. Other devices, such as the Ipod Touch are not cell phones, but can access the internet through a WIFI network connection, just like a desktop or a laptop computer in your home, a coffee shop or an airport. Apple developed the iTunes Store website to sell music, movies and software to iPhone and iPod owners. Apple and independent computer programmers write software applications (Apps) that will do about anything imaginable. These Apps are usually very cheap, not more that a couple of bucks, or free to download. If you can think of something that you want your Apple device to do, most likely, “There Is An App For That”, including Astronomy. Sky Voyager: This is a very good Planetarium program that very accurately shows the locations of Deep Sky Objects, planets, the moon, stars and constellations, very similar to “Stellarium” or other planetarium software programs for computers. This App will also show the brighter comets and asteroids and identify and plot passing artificial satellites. Pocket Sat 3: This is a free App that will predict the passage, or identify artificial satellites as the pass overhead. The orbits are projected on a image of the constellations in the night sky in real time. This App will let you know when a Satellite such as the International Space Station will appear overhead up to a year in advance. How many times have you been out at night, and wondered what that bright, moving light was. This App will tell you. Iridium Flares: This free App will predict when, where, and how bright Iridium Flares will occur. Moon Globe: Very similar to “The Virtual Moon Globe”, this App will help you identify or locate lunar features with a “3D Photo Quality” map. Mars Globe: Very similar to Moon Globe, this App is for Mars, based on NASA spacecraft photos, with a “3D Photo Quality” map. NASA App: This App takes data from NASA's Internet Website via a WIFI Connection and gives you instant access to the latest NASA News, Photos and Videos. These are just a few of the Astronomy Apps that are available at the Apple iTune Store. New ones are added from one day to the next. What's New On (Or Under) The Sun? Images from EIT at 195 and 304 angstroms, MDI Magnetogram, and LASCO C3. In the dark and gloomy days of winter, is there still a way to engage in observational astronomy? Did you know you can observe the Sun when it’s cloudy? Did you know you can observe the entire night sky in the daytime? What about observing the Moon when it’s not visible in the night sky? These are all possible with some help from your computer and the Internet. The Solar and Heliospheric Observatory web site provides images of the Sun in many different forms. All of these images are taken every few minutes, so you can follow activity on the Sun in near-real time. Images from the Extreme ultraviolet Imaging Telescope (EIT) are taken in several different wavelengths of ultraviolet light (304, 171, 284, and 195 angstroms). These wavelengths correspond to different surface temperatures on the Sun, from 60,000 degrees Kelvin to over 2 million degrees Kelvin. The hotter the temperature, the higher in the solar atmosphere we see. The Michelson Doppler Imager (MDI) captures data that provides us with a view of current sunspot activity, such as this magnetogram image. The Large Angle Spectrometric Coronagraph captures activity in the solar corona by blocking out the overwhelming light from the Sun itself so the delicate corona can be seen. This allows us to see streamers and radial bands in the corona that would otherwise be invisible. Visit SOHO Explore! to learn more about the Sun and how it works. Want to observe the Moon? The Virtual Moon Atlas is a free software download available for Windows, Mac, and Linux PCs that allows you to view very high resolution photographs of the entire surface of the Moon. There are thousands of identifiable features and a huge amount of detailed information, including multiple scientific overlays, including rock types, presence of certain trace elements, altitudes, surface temperature, iron oxides, etc. The program is available in over a dozen languages, with complete documentation, quick star guides, and a multitude of downloadable add-ons including textures and picture libraries. PocketLun, the Pocket PC version of VMA is even available for Windows Mobile devices. VMA is a professional-level program and will provide even the advanced the Lunar Observer with hours of observational study. There are a number of free sky chart programs on the market. The most notable is Carte Du Ciel (literally “Sky Charts”,) by Patrick Chevalley, the author of Virtual Moon Atlas mentioned above. Carte Du Ciel (CDC) has as many databases available as many of the expensive commercial offerings, and charts can be printed to great detail - as deep as most, if not all, printed star atlases. Many amateur astronomers use CDC as their software tool of choice when it comes to controlling a telescope in conjunction with their astroimaging equipment. 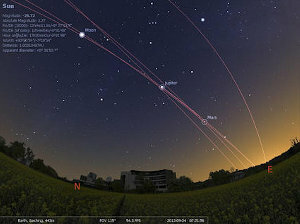 There are also planetarium programs free for the download, such as Stellarium. Stellarium displays the night sky much as it would look to a naked-eye observer out under the stars. This includes such things as light pollution, fog, meteors, and the effects of the full moon and sun in the sky. 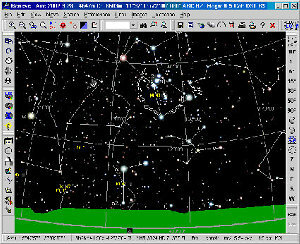 Stellarium can be used as a basic charting program, but printing charts is not it's forte. It's much more at home displaying the night sky in a realistic way. Stellarium has a planetarium projection mode that can be used with an appropriate projector to display the entie night sky form horizon to horizon in a dome. See their web site for more information. Both of these programs are great tools and would be welcome in any amateur astronomer’s kit. On a cold gloomy night in January, though, the best way to view the heavens is with WorldWide Telescope. 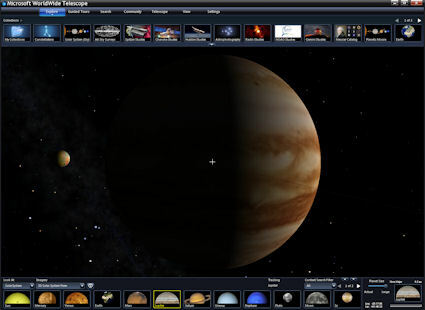 WWT is a free product from Microsoft Research, and is available in the form of a Web Client for Mac, or as a download for Windows, that basically turns your computer into a Virtual Telescope. WWT brings together images from some of the world’s largest ground and space-based telescopes in a way that allows you to explore the universe in a seamless virtual environment. The images are breathtaking, and WWT provides a large number of guided tours that allow you to travel on a exploratory journey along with various astronomers from famous observatories and universities. See how dust in the Milky Way condenses into stars and planets! Travel 2 billion years into the past and learn how gravitational lensing works! So you can’t get outside and see the night sky? Observe anyway, using these fantastic tools and the Internet! FREE Trips to the Moon! Virtual Moon Atlas Expert 2.0. [NOW v. 3.5 avail] - Use this URL to install a FREE software package that will allow you to have some of the most fun on the moon you can ever imagine, right from the comfort of your home. 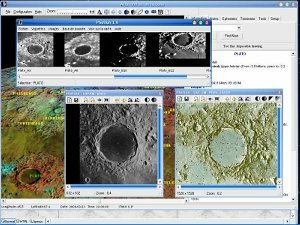 Virtual Moon Atlas is a freeware software program that gives you some pretty impressive abilities to study the moon on your home PC. I've only found and loaded this fascinating program a few days ago, yet from the little time I've spent playing with the zoom and movement buttons, I'm thoroughly impressed. Taken with the fact that this program is a FREE download, I absolutely had to write this quick little article to let everyone know about it. Click on "read more" below for the address to download VMA for yourself. The following is not an endorsement, but is for your information only. Any telescope compatible with Autostar, LX200 or Gemini command set. Celestron software yet to be developed. DarkAdapted (free) is a gamma control application program. It modifies your screen gamma settings so that you may, for example, preserve your dark adaptation while using your computer. High-resolution sliders allow you to adjust red, green, and blue video components individually and in real time.